Verdun is changing. Like many of the old working-class neighbourhoods on the island of Montreal, it is now home to new immigrants from all over the world as well as artists and students looking for cheap rent. For much of the twentieth-century however, it was a working-class town of French and English speakers. Immigrants themselves, they came from the surrounding countryside and from Scotland, Ireland, and England to make new lives in the two and three-storey walkups that lined the avenues. Unlike Montreal, which was divided linguistically, Verdun was a community that was both bilingual and multicultural even before the term was coined. For those unfamiliar with Verdun, it was, until 2002, a separate city on the Island of Montreal. When Verdun came into being at the end of the nineteenth century, the city founders decided that their territory was not to be sullied by the noxious fumes of industry, nor by the vices associated with alcohol and hotel rooms. Consequently, Verdun remained “dry” and industry-free throughout most of the twentieth century. What it did have was an abundance of churches whose many activities structured the leisure time of parishioners prior to the introduction of television and the Internet. Verdun was a quiet place for people of modest means to bring up a family. If there was a stigma attached to growing up in Verdun it was that people from Verdun were tough. Some of this toughness was channeled into organized sports. Verdun was home to many winning varsity teams and to a number of NHL hockey players and coaches. In the late 1960s families began to move away from Verdun: further west if you were English-speaking, or to the new suburbs on the “South Shore” if you were francophone. The introduction of Free Trade in the eighties and a shift in manufacturing away from the Southwest eliminated many of the local jobs. Consequently, Verdun fell on hard times; the population dropped and the welfare rates went up. In the fall of 2006, I was asked by Dawson Community Centre to create a workshop series for seniors on the history of Verdun. Dawson serves the English-speaking community in Verdun and was aware that the generation that had built Verdun and had been a part of its ‘golden age’ was beginning to pass away. Instead of the usual darts and cards, they hoped a history project would provide a different kind of stimulation for their senior members. The approach I took to creating these workshops was more art than science. After a few meetings, a core group of seniors passionate about Verdun and its history formed. We began with a mapping workshop where participants were asked to draw maps of their first neighbourhoods and to share their memories. This activity generated an outpouring of stories and provided the direction for the rest of the project. Using old photographs, maps, and objects, we spent the rest of the workshops fashioning collages from our memories. A quilter in the group suggested we transfer the collages to cloth and sew them together to make a large quilt. None of this description conveys just how much pleasure we had doing this together. Everyone in the group, with the exception of myself, had never made a collage before, but they all did so with humour and grace. Some of these good feeling were captured on video by film maker Leila Marshy in “Cutting, Pasting, and Remembering,” which premiered at Concordia University’s “Sharing Authority” conference in January 2008. The website www.verdunmemories.org . was created to provide a home for the Verdun Memories project and a place for it to grow. I will continue to collect stories from the older generation but would also like to add the voices of the newly arrived. 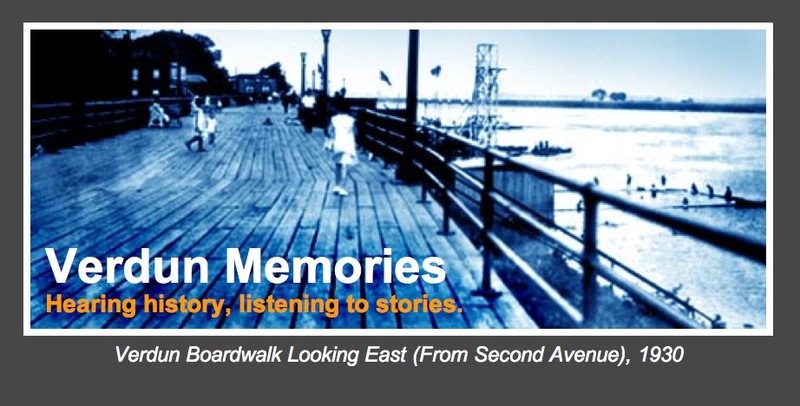 We need more projects like this, projects that will involve individuals and communities as they actively explore what it means to remember. Remembering out loud and with a witness creates new connections between people and among groups, while providing opportunities to express an intelligence that is often lost when people are separated from their memories.